↑ "In Bed With Bruce Willis (on Broadway)". न्यू यॉर्क टाइम्स. September 10, 2015. पहुँचतिथी September 12, 2018. ↑ "12 Most Unlikely Action Movie Stars". Rolling Stone. July 30, 2014. पहुँचतिथी September 12, 2018. 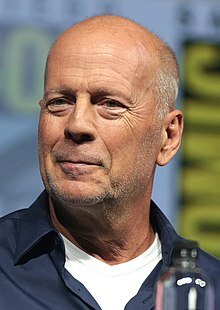 ↑ "Bruce Willis Movies: 9 Reasons Why a 57 Year Old Man is Still Our Favorite Action Hero". Mic (media company). November 14, 2012. पहुँचतिथी September 12, 2018. ↑ "Ford and Willis voted best action heroes". The Daily Telegraph. May 4, 2008. पहुँचतिथी September 12, 2018.